Clown Costume, too common you say? Yes, many people at a party may dress like a clown but with the large variety of different clown options available, you are bound to stand out. With so many Clown accessories and options for you to add to your costume, every look will be different, some scary clowns and some happy clowns! Being different from the rest of the crowd is easy once you see all the different clown options we have available for you to choose from. One of the main features of being a clown is the type of makeup you choose, the colors and scheme you go with. Everyone wants to be the cool clown at the party and with a blank canvas, the ideas and designs are endless. Many start off with white paint as a base and add different colors to add design to the canvas. Now you have the white face down, time to start looking at the rest of your options. Red nose perhaps, that is one of the most popular clown trademark ideas. Other colors can be used for the nose, ears, eyebrows and the mouth outline. Face make up all done? Let’s move on to the unique accessories that clowns play with, starting from large scissors to horns to honk, big clown shoes and the famous colorful wig. Not enough you say, well you can always add more tools like the flower toy or the rubber chicken. 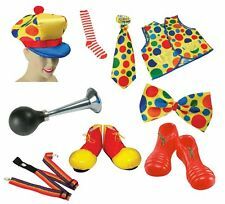 All these great clown accessories work great to complement any type of clown costume.